It was my month to choose a book and host book club in November. 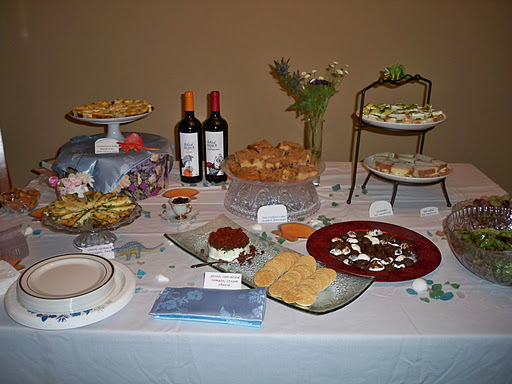 Not only do I love reading, but I also love hosting parties. The book I chose was Remarkable Creatures, by Tracy Chevalier. And since the book is based on the lives of spinster women searching for fossils on the coast of England in the early 1800s, (yes, it really is), I chose a tea-party theme with seashells and dinosaurs thrown in for fun. First let me note that I am the only GF eater in the group. It’s been my mission to prove to them all that GF cooking is just as good and that the wheat is not missed. Top that with the fact that we’re vegetarians and there isn’t any meat at our house and I’ve got a real challenge, but I’m always up for a challenge, Dear Chef. The dinosaur is there for a reason, trust me. I decided on making two veggie tarts, (basically quiche without the crust). 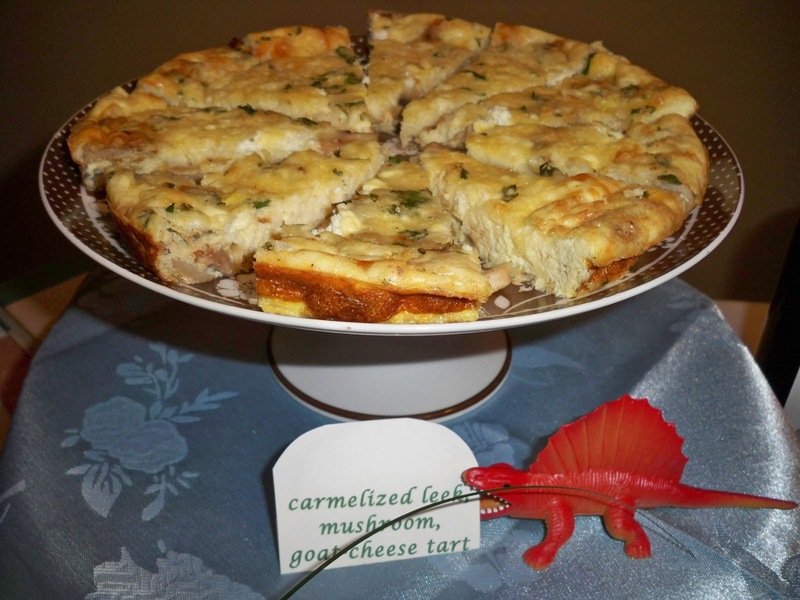 The first was made with carmelized leeks, browned mushrooms, mozzarella and goat cheese. Carmelize one onion and two leeks, then add mushrooms and brown them with the onions. When they’re done, place them on the bottom of a tart pan and spread out evenly. 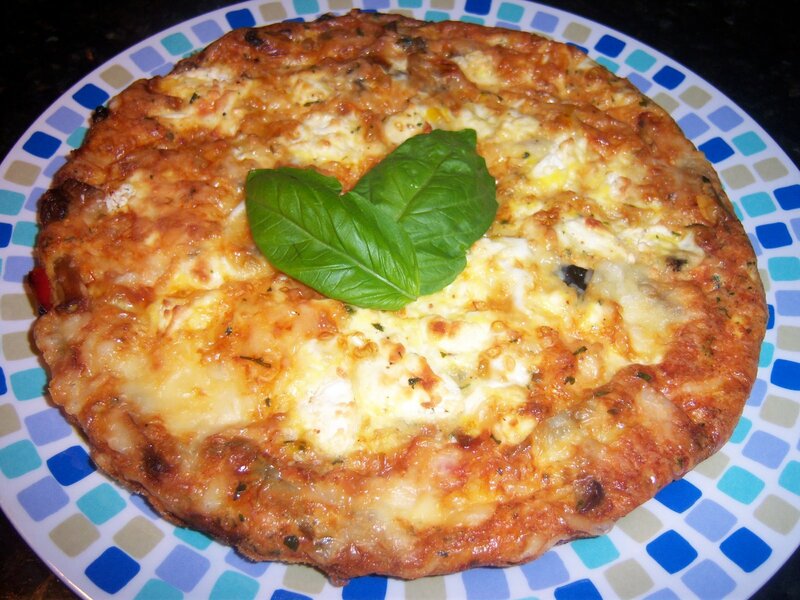 Cover with a layer of shredded mozzarella and about 3 TBS of shredded Parmesan. Sprinkle with chopped fresh thyme and parsley. In a separate bowl, mix together about 4 egg whites and 3 eggs. Add about 1/4 cup of goat cheese and whisk it all together with a pinch of salt, pepper, garlic powder, dried mustard and nutmeg. Pour evenly over the tart and bake in a 350 oven for about 30 minutes. Don’t let it get too brown. Slice when cool and enjoy. I’m always apprehensive about using goat cheese since even though I love it, I have found that people either love it or hate it. But this was first plate to be empty, so I suppose this wasn’t anything to worry about. Another dinosaur, representing the fossils in the book. 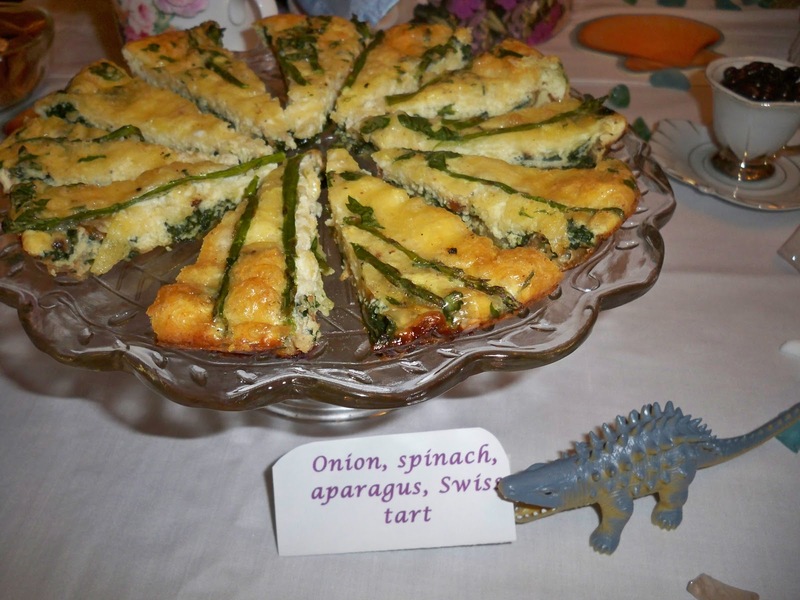 The second tart was onion, spinach, asparagus and Swiss cheese. Start with the onions in a bit of olive oil and butter (as above) and cook till brown and sweet. Add about 2 cups of fresh spinach and cook until wilted. Turn the heat on low and cook for about 10 minutes until the liquid has cooked out of the spinach. Add 1/2 tsp fresh garlic, pinch of salt and pepper. spread evenly into a pie/tart pan. Cover with 1 1/2 cups of shredded Swiss cheese. Take asparagus and arrange in a patter on top of the cheese. In a separate bowl, beat together 4 egg whites, 3 eggs, 1/4 cup half and half, salt, pepper, pinch of both nutmeg and dried mustard. Chop about 1 TBS fresh parsley and add to the mixture. Beat and then pour evenly and gently over the veggie/cheese mixture. Bake at 350 for about 25 minutes, but don’t let it get too brown. Slice when cool. Thanks to Udi’s for the fabulous bread used to make the cucumber sandwiches and the egg salad sandwiches. They were the first to go and not one was left on the plate. Daughter and I kept eating them while making them, we love them that much. Simple to make, really. 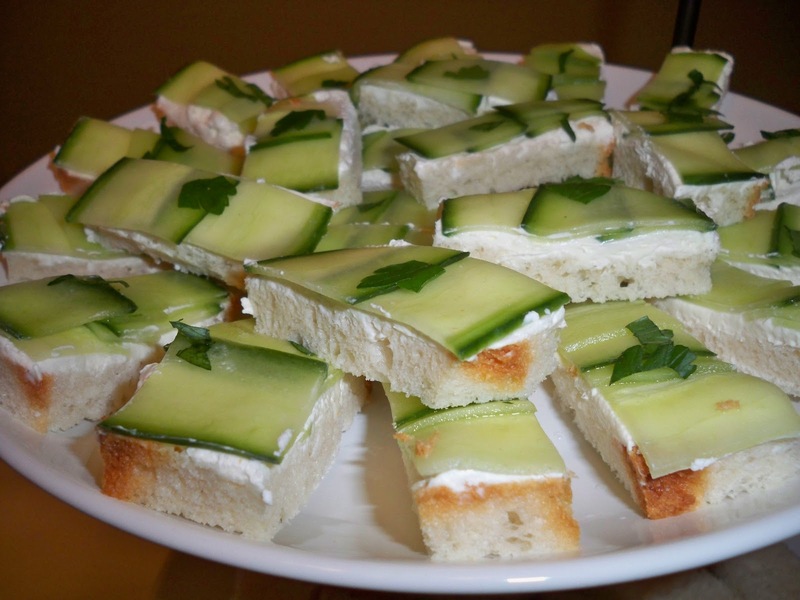 For the cucumber sandwiches, just cut the crusts off the bread, then spread with cream cheese and layer with strips of cucumber (use a veggie peeler for strips) and slice. Sprinkle with a little salt and a bit of chopped fresh parsley. For the egg salad I used chopped egg, mayo, apples, celery, salt/pepper and chopped parsley. I didn’t cut the crusts off of these and they were yummy . 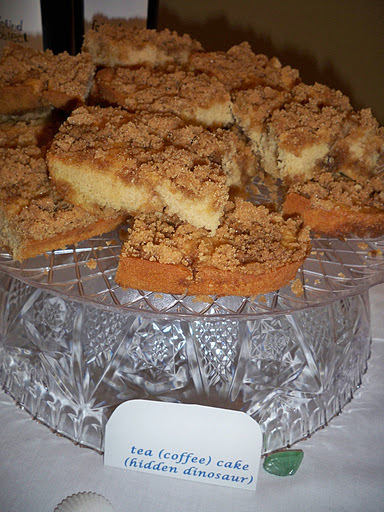 In keeping with the fossil-hunting theme, Daughter actually made a wonderful GF coffee cake and placed a small dinosaur in one of the pieces while plating the cake. (Fossil hunting in the dirt? Too much of a stretch?) 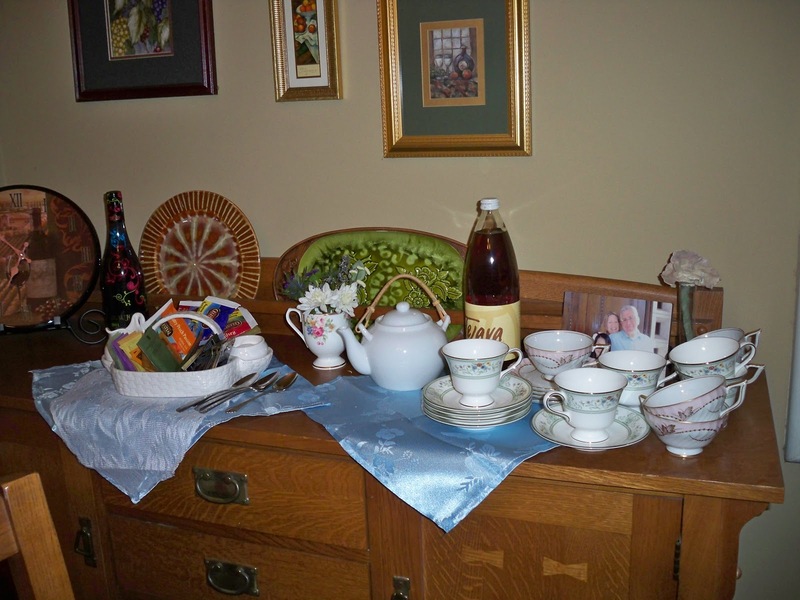 The cake was gone quickly, and worked perfectly with the tea after dinner. 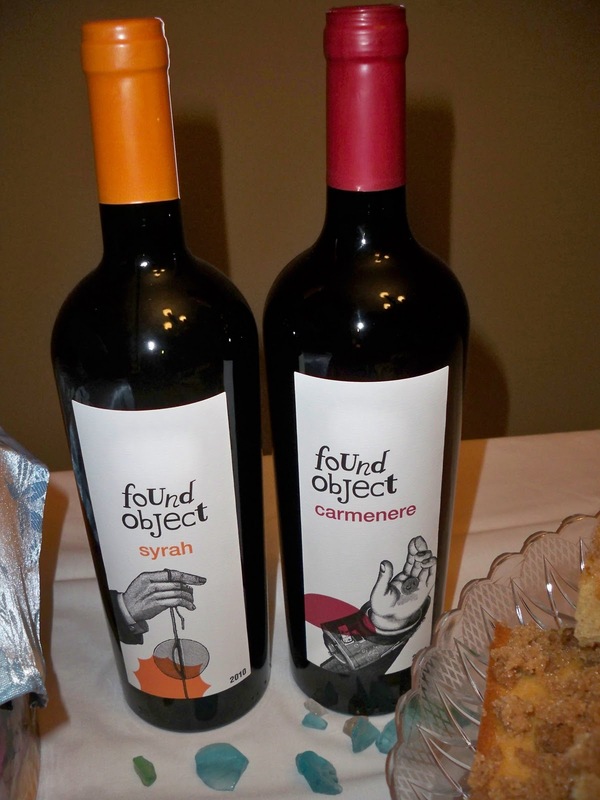 And believe it or not, I found the perfect wine in the spirit of the fossil-hunting theme of the evening. Thanks Trader Joe’s. I was depending on Trader Joe’s for their lovely shell-shaped chocolates to round out the decor. And wouldn’t you know it, they don’t have them yet for the holiday season. What’s a girl to do? Ask her teen to make some chocolate, that’s what. 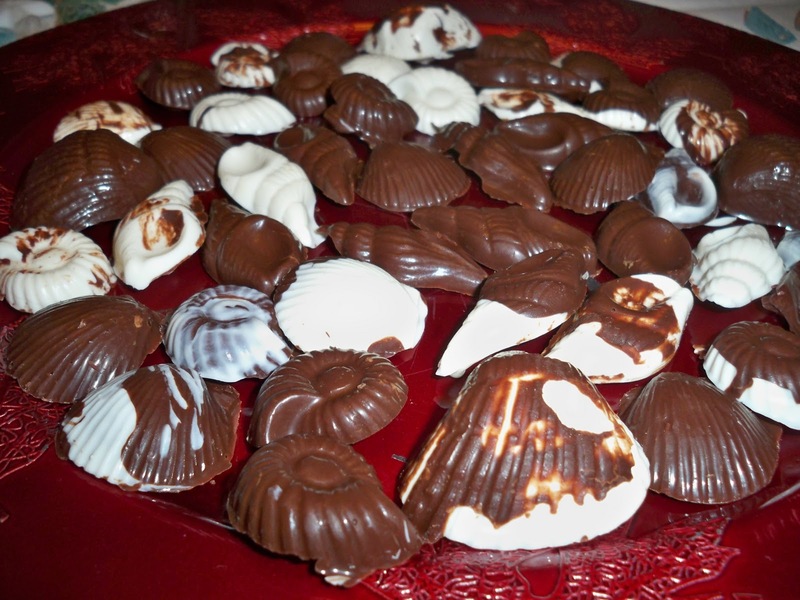 Darling daughter actually melted white and dark chocolate and poured it into molds to give us our shell chocolate. What a doll! The night was rounded out with cheese/pesto/sun-dried tomato torte with rice crackers, caramels with sea salt and a lovely salad of spring lettuce, roasted beets and candied pecans in a balsamic dressing. I’m sad the night is over, but I can’t wait for next month. Try reading the book and see what it inspires you to cook. Enjoy! I’ve been making these for ages and just realized that I had never put the recipe up here. Somehow I thought I did, but I was wrong…what can I say? I came up with these after having one that was similar at Paradise Bakery. I decided to give it a try at home, make sure it’s gluten free, and create something simple. And, Dear Chef, as we all know, simple is better. The ingredients here are few and preparation is a cinch. That’s what makes it so nice. 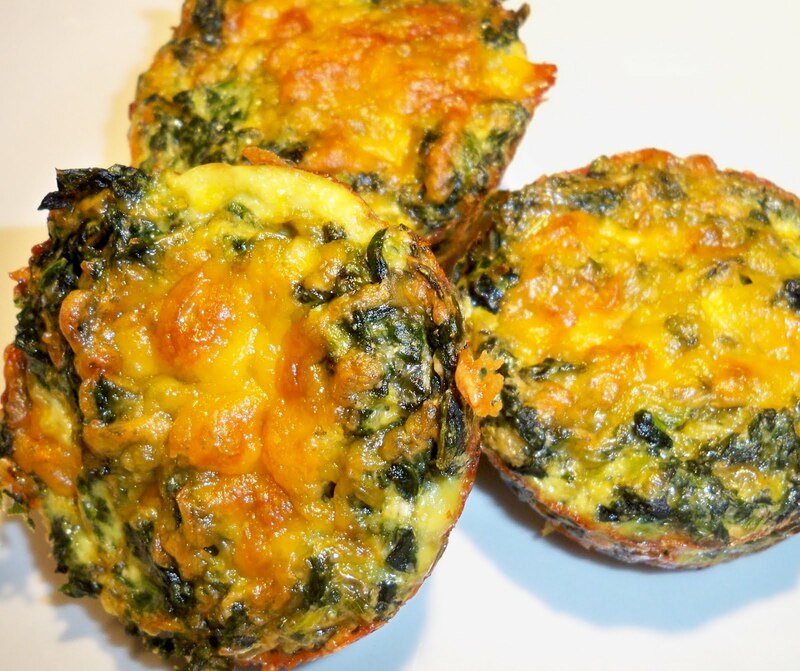 Whip these up in about 5 minutes, bake for 15 minutes and put them away for breakfast or lunch for the week. I calculated the calories for each one and it came out to about 85 per muffin-not bad. You can also use tiny muffin tins and make snack-sized muffins for a party or just for fun. Everyone will think you worked on them forever. 2. Put spinach in a microwaveable bowl and cook for about 3 minutes. Drain and squeeze out the liquid. 3. In the same bowl, add all other ingredients and mix well. 5. Cook for 15 minutes, then turn off the oven and let them sit in the oven for about 5 minutes. 6. Remove muffins onto a cooling rack and allow to cool for just a few minutes. This will help them firm up a bit. I’ve made these with many different kinds of cheese including Fontina, Swiss, Gouda, Mexican mix, and more. Use whatever cheese is your favorite and experiment to find what you like best. These are a great way to get protein and veggies, and my Daughter loves them. Mix it up with different veggies if you want, but the spinach always seems to be the best. I also added the Parmesan recently and it seems to give them a great, salty flavor. Well, at the risk of being boring, I decided to finish up my eggs and make another quiche. 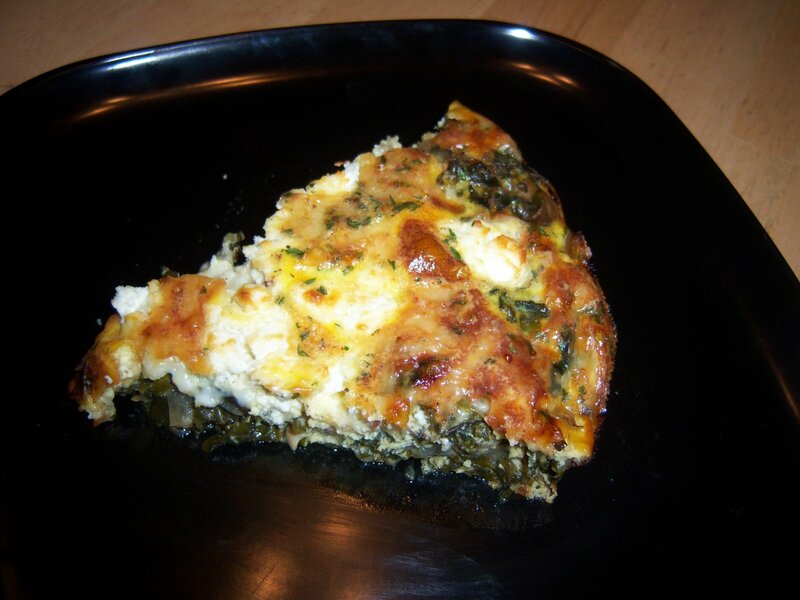 This time, I decided to make my daughter’s favorite…spinach quiche. Usually, when we have company or family over, I’ll make a spinach quiche with a crust for the guests, then a roasted veggie quiche for myself and anyone else who wants it. This time, I decided I wanted the spinach quiche to share. It turned out great, and I actually caught my husband eating it from the pan. That’s something, he usually doesn’t like quiche without a crust, but he said he couldn’t stop himself, it was that good. My daughter ate two pieces right away and declared it the best. I just love rave reviews! I think the balsamic vinegar makes a big difference in the veggies. I love the flavor it brings out of the veggies. Plus, this is such an easy meal and leftovers the next day are even better. Also, anytime you have to make something for a potluck, make one of these and you’ll be sure to have something you like. When you eat GF and vegetarian, that’s a real necessity. Remember, you can put almost any veggie into a quiche, just make sure you sautee them and get out as much of the water as possible so your quiche isn’t mushy. And also be sure you use good cheese. Sautee onion in olive oil on medium heat until carmelized (about 7-10 minutes). Add mushrooms and garlic and sautee another 5 minutes or until mushrooms are cooked through. Add frozen spinach, balsamic and tamari. Stir well and cook for another 7-10 minutes, or until liquid from spinach is cooked out. In a separate bowl while the spinach mixture cooks, beat eggs, 1/2 and 1/2, salt and nutmeg. Spray a tart pan and pour the spinach mixture in the bottom to about halfway up the side of the pan. Cover spinach with fontina cheese, then dot the top with the remaining goat cheese. Pour egg mixture over quiche and bake for 35 minutes, or until browned on top. Who says quiche needs a crust? One of the things I used to love making is quiche. I was always trying new fillings and different cheeses. When I found out that crust was no longer allowed, I stopped altogether. It wasn’t until about a year after going GF that I realized I could make a quiche, just skip the crust. I had always thought that it would not be as good, but to be quite honest, it’s even better. I would often take off most of the crust on quiche since I wasn’t a big fan anyway. Now, I don’t have that problem. Yes, I know that many people make their own GF crusts and they taste “almost” like the real thing. My philosophy is simple…if it doesn’t take great, why eat it? I don’t eat mediocre bread just because it’s bread, or just an OK brownie since it’s GF and a brownie. If it doesn’t wow me, I don’t eat it. Why waste the calories and time? So, on to the quiche. Or I guess it’s called a tart without the crust, yes? One of my favorites, and the favorite of my children and friends, is a roasted vegetable tart. You can roast the veggies the night before and just use the leftovers for the quiche, or roast them just before making it. The roasting takes the most time… And I’ve also discovered after many tests that fontina cheese is one of the best for quiche, as well as a few dots of goat cheese for a little extra flavor. In a bowl, add eggs and eggwhites. Beat for a moment, then add the next 6 ingredients. Beat well and set aside. Spray a tart pan with nonstick spray. Layer veggies on the bottom of the pan (see directions below). Then layer fontina over veggies. Dot the goat cheese around the top evenly. Pour egg mixture over cheese and veggies. Bake for 45 minutes or until set. Let sit for about 10 minutes to settle, then serve. Slice any variety of vegetables into small, bite-sized pieces. I used a zucchini, 1/2 a red pepper, 1/2 a sweet onion, 5 mushrooms, 1/2 lb of beans (1/2 yellow, 1/2 green) and 1/2 a carrot. If you’re making roasted veggies the night before, just reserve about 1.5 cups before serving. Place veggies in a large roasting pan, sprinkle with olive oil, about 2 cloves of chopped garlic, balsamic vinegar and salt and pepper to taste. Cover with foil and roast for 45 minutes. Remove foil and roast another 45 minutes, stirring about halfway through. If you need to, depending on your oven, you can put the broiler on and brown them for a minute or two.